Healthy Grilling Tips - What's Up, USANA? Summer is in full swing and it’s time to fire up the grill! Say no to the creamy potato salads and shake up your grilling routine with these 7 healthy grilling tips and tricks. Swap your fatty burgers with a leaner meat, like salmon or turkey! To make them even healthier, trade in your bun for a grilled pineapple topper or wrap it in lettuce. Skewer up some of your favorites at your next neighborhood BBQ! Shrimp, chicken, bell peppers, zucchini, yellow squash, onions, grape tomatoes and mushrooms are some of the best healthy foods to include. Nothing quite says summer like corn on the cob. And it is packed with nutrients! Dress it up by shaving it into a salad! Did you know? Asparagus contains amino acids and minerals that can help protect liver cells against toxins. Throw a bunch on the grill! 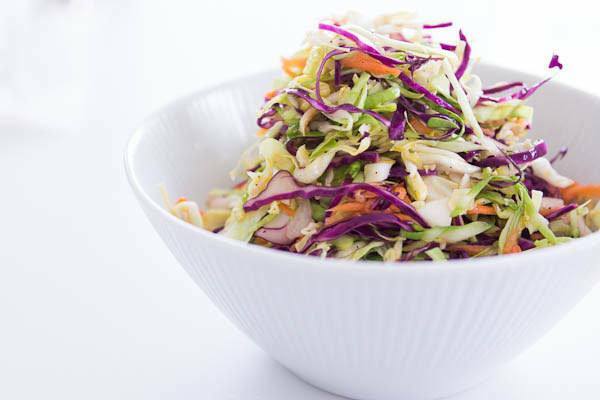 Serve up a delicious no-mayo coleslaw for a healthier, better tasting alternative! You won’t even miss it. Lighten up your chip dip or taco toppings by using plain Greek yogurt instead of sour cream! Same great taste, way less fat. Step away from the pie and satisfy your sweet tooth with grilled fruit! Toss some peaches, pineapples, bananas and more on the flames and relish in the caramelized goodness. What’s your favorite recipe? Do you have any healthy grilling tips we missed? Let us know in the comments! Great article! It would be nice to have the recipe links to the tips and ideas. EG. Coleslaw without mayo what do you replace it with? Great recipes healthier than usual foods…gonna share info thanks.